The name is Billund Airport and it’s located in the middle of nowhere but this, there is a good reason for. The airport was originally founded by a group director in 1961, as a private airfield. But over time, more and more surrounding entities became interested in realizing a project to make Billund Jutlanders preferred airport. That succeeded quickly with strong financial partners to raise the money to do the small private airstrip with an associated hangar for a slightly larger public airport. The project quickly took off and already in 1966 it was the first terminal ready to receive and send passengers away from Billund. In time, Billund Airport expanded quietly, giving rise to the creation of many new jobs. This helped to boost Billund very rapidly, that now had both a theme park and the airport, located just up to each other. At the same time the amusement park benefitted from the airport’s location, as it was easier for international visitors to get to and from Billund. In 1997, after some years with good success was chosen to further extend Billund Airport to be closer to what we know it as today. An architectural competition was held where you could come up with ideas on how the new terminal should look like. It was an excellent architectural firm that won. The new passenger hall was no less than forty thousand square meters, which was very unheard of considering the airport’s current size. The new hall would handle all normal passengers to domestic and international. While the old part was to handle private and cargo flights. The new passenger hall invigorated Billund Airport in many ways. Over time, the airport and theme park developed into a trademark for the area. Later a water park and a holiday complex has been made. One thing that many from afar enjoy. Therefore, you could describe Billund Airport, as something of a success story that started up as a very small private airstrip to an exit point for many Danish travelers. 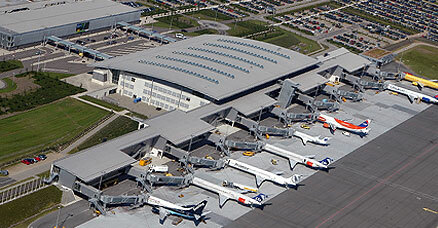 Billund Airport is also very influenced by the surrounding attractions. This can be seen from the fact that around the airport there is advertising and otherwise apparent that they cooperate to get the most out of the opportunities they have.